Host your next office party, reception, celebration in a beautiful art gallery overlooking Kingston’s Historic Market Square. Suitable for book launches, cd release parties, intimate concerts and private events. We are very skilled at the use and manipulation of our space and can create a lovely experience for your event. 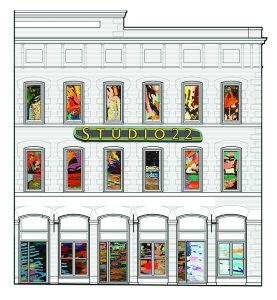 The Idea Manufactory at Studio22 is an in-house graphic design and print shop and can be hired to produce flyers, posters, menus, invitations (both printed and web- versions). 1000 sq. ft. commercial art gallery located on the second floor of 32O King St. E. with a beautiful view through six large windows that overlook Market Square. Truly, one of the best views in our city. The above capacities are estimates and subject to the current demands of the gallery and the event requirements.